By far, Inception is the best movie of the year! It’s entertaining, dramatic, action-packed and it makes you think. I don’t remember the last movie that made you want to discuss it for hours with friends afterwards. If all you care about is the movie, the DVD is the way to go. But either way, Inception needs to be own to watch over and over again. I’m not sure why I should even bother talking about what the movie’s plot is because I’m sure most of you saw this already. But I’ll summarize as quick as I can. The movie centers around Dom Cobb (Leonardo DiCaprio), a professional espionage spy that extracts vital pieces of information from people through their dreams. Unable to go back to America to visit his children, Cobb is offered one last job from Saito (Ken Watanabe) that’s almost impossible. Instead of stealing information out of someone’s mind, they are trying to plant an idea in someone’s mind. But if it means getting back home to see his children, he’s willing to do it. Helping him out is his point man Arthur (Joesph Gordon-Levitt), a newbie yet smart architect Ariadne (Ellen Page), a chemist Yusuf (Dileep Rao), and a forger Eames (Tom Hardy), who can change appearances in dreams. In order to do what they have to do, they have to go into several levels of someone’s mind in order to plant the idea. Besides that, they have a few other things to worry about that Cobb isn’t telling the rest of the group. I loved loved loved this movie. Everything down from the cast to the film score. The ensemble cast was excellent; who knew Joesph Gordon-Levitt could pull off the action stuff he did in the movie. Tom Hardy became an unknown to superstar over night thanks to this movie. I remember when he played a minor character in Band of Brothers as well. Even the other actors like Ellen Page, Ken Watanabe, Dileep Rao and Cillian Murphy all did a wonderful job. Of course, you can’t forget Leonardo DiCaprio. I didn’t like him when he first started out but each movie he does now intrigues me. He really knows how to pick interesting movie roles. You could say this role was slightly similar to his Shutter Island character in a way. This movie wouldn’t be what it was if it weren’t for Christopher Nolan though. He’s been writing this story for 10 years and it really paid off. Just when you think he did his best movie with The Dark Knight, he continues to top himself. This movie also works so well just based on the visual effects alone. If the effects looked cheesy in any way, it would have taken the audience out of the movie. I’m still scratching my head on how they managed to do the floating bodies thing and some of the other things you see in the movie. Let’s not forget Hans Zimmer’s brilliant film score. Having Johnny Marr come in to do the guitar work with him was just a genius idea. This score proves that Zimmer is one of the best, if not the most innovative composers out there right now. The Extras for the DVD aren’t that extensive and it makes me want to get the Blu-Ray instead. But I’m not sure how great the extras for the Blu-Ray either since I only have the DVD. 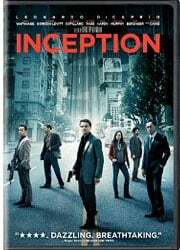 The DVD has small featurettes on the ideas of Inception, the set of the Japanese castle, designing the M.C Escher staircase, and how they did the Freight train through the street. Just teases on how they did things and it’s frustrating to watch because the extras are good. But when each featurette isn’t longer than 3 minutes, it’s frustrating as hell. I’ll probably go out and buy the Blu-Ray because this movie should be watched in that format anyway. Inception needs to be seen, and seen a few times. I’m still wondering what exactly happened in the movie and I’ve seen it twice now. Who knows what happened at the very end, but I have a feeling everything was real. I really don’t know and don’t think we’re going to know unless there’s a sequel. Having a sequel will be great but it might make the ending of this movie less effective and powerful. The Freight Train – Constructing The Street-Faring Express Train. Bottom Line: Best movie of the year!